Pole Fitness Ottawa / Classes, Workshops & Parties. All Pole Fitness Ottawa instructors at Cherry Blossom Studio are certified in CPR, First Aid, AED and all adhere by the guidelines of their profession. Andrea learned pole dancing while living in New York City and has taken advanced workshops with some of the industry’s top professionals over the years. She has been pole dancing for fitness, for over 10 years and Instructing since 2008. In September 2010 Andrea competed in Miss Pole Dance Canada, The Great White North in 2016, The Toronto Pro Show in 2017 and The Canadian Nationals in 2017. 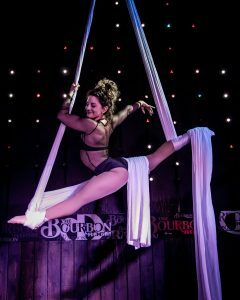 She also organizes Aerial Cabarets with Cherry Blossom at the Bourbon Room every couple months. Andrea has also judged the Just For Laughs (JFL) Pole Fitness Competition in Montreal, organized the very first Ontario Pole Fitness Championship in 2012 bringing pole fitness competitions to Eastern Canada and judged the Quebec Pole Fitness Championships in 2015. Andrea is a Certified Personal Trainer Specialist since 2008, Certified Pole Fitness Instructor, Aerial Hoop and Aerial Yoga Instructor with PFIC and is also on the Board of Directors for PFIC Canada. Andrea’s Pole Dancing experience and Personal Training experience helped her realize her dream of opening Cherry Blossom Aerial Dance Studio. Andrea has designed Cherry Blossom Studio as a place for women to let their bodies bloom! Daniela’s original plan to be a mermaid when she grew up never panned out so she settled for studying biology at the university of Ottawa instead. She loves training on the silks, lyra and pole and cannot wait to make you break a sweat. She loves her CB family and always welcomes new additions to the girl gang. Kristen has been pole dancing since 2014 and is ecstatic to finally teach and share her true passion of pole dance with newcomers and and fellow members at Cherry Blossom. What got her hooked in and never looked back is the strength, drive and sensuality it brought into her life and how supportive the pole community is worldwide. Kristen will be teaching pole on Sunday fun days and will be doing bachelorette party requests. Get ready to turn your life and lifestyle upside down. Known as “the hip-swinging fox with the fiery locks,” Randi Rouge is a burlesque instructor, performer and model from Ottawa. She is part of the House of Tease, an Ottawa based burlesque troupe and has a dance background in jazz, ballet, musical theatre, belly dance and more. Randi has performed in both the Montreal and Ottawa Burlesque Festivals, as well as shows in Toronto and Kingston. She is known for her contagious energy on stage and off! Corinne is all about theatre, feminism, power-lifting, camping and pole dance. She has started training on pole at Cherry Blossom in January 2017 and fell in love with the strain, bruising and glitter. She began working with the Cherry Blossom team as a pole instructor in January 2018 and is now a certified pole fitness instructor with PFIC. She’s always looking for a new adventure and encourages all students to woman up and bring their strongest. sexiest, feistiest selves to class. Chelsea came to Cherry Blossom in September 2015 and has been living her best life ever since. She’s never met an apparatus she didn’t love, and she’s climbed everything but the walls. When she does manage to force her feet back on the ground, chances are she’s experimenting in the kitchen or covered in spray paint. Whether you want to become a metal ballerina or a skydiving swan, Chelsea is determined to help make your wildest aerial dreams come true! Rae-Ann moved here from the west coast. She came to us to try out aerial silks and discovered the aerial hammock, She immediately fell in love! She has never looked back and is now working on teaching Aerial Yoga. Keitha came to the studio looking for an escape from the cold winter blues and instantly fell in love with Cherry Blossom. 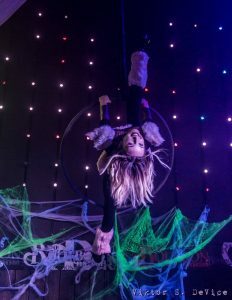 She has been attending classes for just over a year and hopes to keep reaching new aerial heights.